The 152-mm Gun-Launcher Main Battle Tank 70 (shortened as MBT-70) is a rank VI American medium tank with a battle rating of 9.0 (AB/RB/SB). 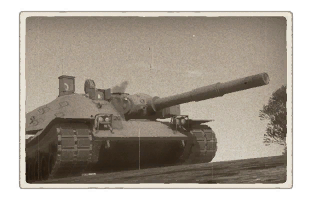 This tank was introduced in Update 1.71 "New E.R.A". The MBT-70 handles like virtually no other vehicle (barring the KPz-70, its German twin) in the game in terms of its ability to pick up and maintain speed over various terrains. Cross country mobility is arguably the best currently available in the game and is one of the signature traits that stands out about it. 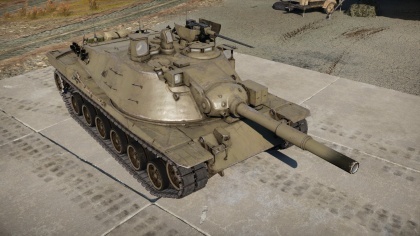 Unlike the Soviet T-64A (its main rival), the MBT-70 does not utilise composite armour, but an air gap that forces munitions penetrating the initial layers to lose their mass by fragmenting apart before moving to the next layer of armour. This general design concept has been in use as far back as World War II and is even used to this day on modern fighting vehicles. Spaced armour works wonderfully well against shaped charge munitions or any other munition with explosive filler provided it is of a stronger protection rating. Proceeding weapons and munitions development has seen this benefit decreased with either more powerful or tandem-charge warheads and can be seen in-game against weapons that proceeded different designs of spaced armour. As such, the MBT-70 will find itself against weapons that were designed to defeat spaced armour such as the HOT-K3S ATGM and BAE Swingfire system that will penetrate it. However, the spaced armour in the MBT-70 works exactly as it was designed to do against older anti-tank missiles, HEAT, HE, and HESH munitions. The tank mounts no external spaced armour. The armour on the side and rear of the tank is not worth mentioning as it will only stop light machine gun fire and some cannon fire on the turret. Adversary sabot rounds will penetrate clear through the engine and into the crew compartment most likely destroying the MBT-70 if engaged from behind. The most important feature that makes a tank is the cannon. In this department, the MBT-70 is no slouch. The 152 mm gun launcher system (similar to the one used on the M551 Sheridan), but with a longer barrel and is capable of firing a variety of munition types including an experimental APFSDS round, a traditional HEAT round (with high penetration), an experimental smoke round, and lastly the very capable and proven MGM-61C Shillelagh. This wide range of munition choices gives the operator a variety of options in pre-combat configuration which can greatly either hinder or enhance the tankers capability on the battlefield. The benefit of a longer barrel compared to its Sheridan counterpart ensures the MBT-70 is much more accurate at range and that the rounds leave the barrel at higher velocities thus increasing their overall damage dealing capabilities. Additionally the 152 mm gun launcher gets equipped with an auto loader, greatly reducing its time between followup shots on a target. For targeting, the option to equip an incredibly accurate laser range finder is available. Additionally the 7.62 mm machine gun mounted in the turret can be used for range finding as well. The Rheinmetall Rh 202 20 mm auto cannon is highly effective at dealing with light armoured battlefield threats and on some tanks exposed sides or rears. In some situations, it may be more beneficial to utilise the 20 mm as it will allow the tank to deal damage rapidly while conserving the main cannon ammunition. The cannon is also highly effective at shooting down low flying attackers. Note that if the commander is knocked out, the 20 mm will be unable to be used. The MBT-70 is equipped with a 1,470 horsepower air-cooled Continental V-12 diesel engine. This engine pack compared to its German counterpart produces slightly less power, but both vehicles handle essentially the same. A highly advantageous feature is the hydro pneumatic suspension system which not only provides great cross country mobility, but allows the crew to position the vehicle in such a way to only expose the strongest armour at an enemy threat. The suspension can also be used to gain further gun depression by raising the rear of the tank and lowering the front thus allowing the gunner to engage from a position that he might not have been able to engage from previously. The MBT-70 features the standard NATO track and rubber block design. The rubber track blocks provide great traction off road and on road compared to all metal tracks found on other fighting vehicles as sliding on a short halt or drifting is minimised. Because of the elevated engine deck, gun depression is decreased significantly when firing or aiming the gun over the rear of the tank. An unconventional feature at the time was that the MBT-70 was designed to house all the crew members in the turret. Because of the autoloading system, the need for a loader was eliminated and due to an attempt to further lower the tanks silhouette, the driver was located to the turret with the gunner and commander. This can have potentially devastating consequences on the battlefield as the crew can easily be injured or knocked out by penetrating munitions entering the crew compartment. For defensive countermeasures, the tank is equipped with two quad barrel externally mounted smoke canister launchers on both sides of the turret, which can provide either a defensive screen for itself or friendly forces. These launchers can be fired in pairs of two. Keep in mind the smoke grenade launchers are operated by the gunner so should the gunner become incapacitated in a fight, the smoke will be unlaunchable until the gunner is replaced by another crew member or by the crew replenishment consumable. Due to its low profile and effective array of camouflage options, the MBT-70 scores high marks in the concealability category. The addition of various foliage can further increase the ability to conceal the tank. Gun mantlet ring around the gun barrel is 305 mm thick. Hull spaced armour configuration is 34 mm RHA + 127 mm air + 46 mm RHA. Turret spaced armour configuration is 38 mm RHA + 127 mm air + 130-33 mm RHA. Turret rear spaced armour configuration is 13 mm RHA + 38 mm air + 19 mm RHA. The MBT-70 is still an average medium tank with weak side armour. Thus, flanking is a good strategy to take for a shot at the weak spots. Go for the ammo, which is located in front of the engine, or in the protruding end of the turret. If in a head on engagement, shoot it directly below the gun, but above the upper glacis. This spot has 250 mm of armour with no composite armour. This shot, if successful, should knock out most of the crew, and maybe even the horizontal drive, allowing for a flank in a fast vehicle. Ammo racks for he MBT-70. Racks 4 and 5 deplete top row together first before emptying in the second row. The tank plays very much like the M41A1 Walker Bulldog. Players familiar with the hit and run play style will easily adapt to the MBT-70. Its fast speed, especially with full upgrades and aced crew, allows it to maneuver into spots not typically accessible by less mobile tanks. Utilize this to an advantage to set up ambushes as this is how the MBT-70 will get most victories. It's important to recognize when an engagement is not beneficial to the tank so that it can re-position itself or escape from the threat. Despite the initial appearance of strong frontal armour, it's important to remember when compared to its counterparts at its rank, it is not nearly enough to defeat threats head on such as the T-64A. Even ATGM from missile vehicles such as the Raketenjagdpanzer 2 HOT will penetrate the turret and upper glacis plate. Even other Rank V tanks can and will penetrate from the front. 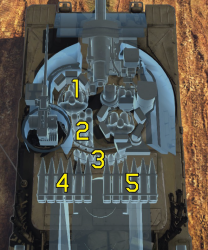 Because of the rather condensed placement of crew and ammunition, the MBT-70 will most likely be destroyed with one shot. Because of this, it is critical to get the first shot off in an engagement and ensure it is either an eliminating shot or one that cripples the threat to such a capacity that they either cannot engage, will instinctively panic and try to run to repair or determine the engagement location and direction. The gun is especially versatile and powerful with a wide range of ammunition selection, but the cannon-launched ATGM's and sabot rounds will generally be able to get the job done in most situations. The 20 mm turret roof mounted cannon is great for taking out lightly armored targets (to include some tanks, ATGM vehicles, etc), anti-air, and aircraft. Essentially if this tanks is treated like a light tank or fast medium tank, the survivability will increase dramatically. The hydropneumatic suspension allows for positioning the tank in such ways that it can engage from non-conventional spots while exposing only the strongest armor at the threat. The low silhouette makes the tank especially difficult to hit at longer ranges and this can be further enhanced by the adjustable suspension depending on the situation. Because of the accurate cannon, the MBT-70 will also find it to be easy to engage at longer ranges, which will maximize the strengths while reducing the targets. In summary, the MBT-70 is a great addition to any end game lineup as it provides great flexibility in almost all engagements and is well worth the time and investment to acquire. Ambushing is the MBT-70's strength. As covered previously, utilize the speed to get into firing positions quickly and cause chaos and confusion among the enemy. In arcade battles, an MBT-70 can usually reach key positions quicker than even some 10.0 BR main battle tanks. This is only provided if it consistently drives in a linear format. The MBT-70 can also quickly capture objective points and when used properly, it can hold these positions so long as it does not stay in them for too long. Scoot and shoot tactics will benefit the MBT-70, as well as terrain masking techniques. Should the MBT-70 have to fight in closer engagement ranges or in close quarters, it is critical to always remember that the armour will not protect the tank reliably; however, the speed, fast rotating turret, and maneuverability will. Provided the player utilise these traits to its advantage, the MBT-70 will be able to control the fight. Recognise when the MBT-70 is being baited into an ambush and avoid them as the MBT-70 doesn't stand a great chance of conducting a counter ambush due to the weak armour, which will allow the MBT-70 to be destroyed easily at close range. If the MBT-70 finds itself a victim of an ambush from an opponent, launch a smokescreen, escape, and reassess for a counter ambush. The MBT-70 benefits greatly from squad play. A skilled lone MBT-70 is most certainly a threat on the battlefield, but two or even three MBT-70's working in conjunction with each other in a squad is an extreme danger to the opposing team as the use of squad tactics in combination with the great strengths of the tank can almost completely control the momentum of the conflict. Like for most other tanks in-game so far, go for the Parts first, then Horizontal Turret drive, then for the FPE. After these critical upgrades, go for the APFSDS Shell, then either engine upgrades or gun upgrades, depending on the play style. Optics, Tracks, Suspension and Brakes shouldn't be a Priority #1. Has a top mounted 20 mm anti-aircraft cannon installed which can also be used to defeat lightly armoured vehicles reliably with its 44 mm of penetration. Has access to hydropenumatic suspension, useful for hull down engagements. Generally less protection from composite armour, relative to other Rank 6 tanks. Vulnerable to the rear due to raised engine deck, it can be solved if hydropneumatic suspension are used. Cramped interior, loss of more than one crew member more likely when penetrated. In the early 1960s, West Germany and the United States began work on a joint project to create a standardized new MBT design that would meet specific requirements set by both nations. The cause for this, was the introduction of the powerful Soviet 115mm smoothbore cannon, mounted on the T-62. The new cannon presented a serious issue for the respective primary fighting vehicles of the two nations - the Leopard 1 and M60. Thus, work on the joint project, designated MBT-70 in the US and KPz-70 in West Germany, began in 1964. Right from the start, development was plagued by disagreements between the numerous design team members, due to the differing engineering practices of the two sides. By the time the disagreements were settled, the project has already suffered from several delays, which in addition to other things, inflated the project’s budget early on in its development life. Nevertheless, the result of the combined effort of engineers from both sides was first put to the test in the mid ‘60s, after the first prototypes were manufactured. The KPz-70 MBT received an innovative design like no other tank before it, in addition to being equipped with some of the latest military equipment of the time, such as hydropneumatic suspension, an autoloading system and laser rangefinding, just to name a few. However, whilst the MBT/KPz-70 did come equipped with some of the most high-tech equipment of its time, the vehicle did also come with its own set of unique problems. Considered to be way ahead of its time, the designers often faced challenges that neither the German or American side of the team was able to effectively address, making the vehicle quickly exceed both weight limitations as well as budget restrictions. Spiraling development costs and design disagreements eventually lead to the Germans backing out of the project in 1969 to continue work on one of their own designs, before the Americans also abandoned the project a couple years later in 1971, leaving a total of 14 prototypes built. Skins and camouflages for the MBT-70 from live.warthunder.com. KPz-70 - German counterpart of the same vehicle. XM-803 - An American "budget" version of the vehicle.